The evolution of ordered mesoporous materials (F. Sch&üuml;th). Biocontinuous cubic lipid-water particles and cubosomal dispersions (K. Larsson). The discovery of the M41S family of mesoporous molecular sieves (C. Kresge et al.). Discovery of mesoporous silica from layered silicates (Kayurzuki Kuroda). FSS-16 and mesoporous organosilicas (Shinji Inagaki). Integrating interfaces and function with molecular assembly (G.D. Stucky, J. Herbert Waite). Designer synthesis of mesoporous solids via block copolymer templating pathway (D.-Y. Zhao et al.). 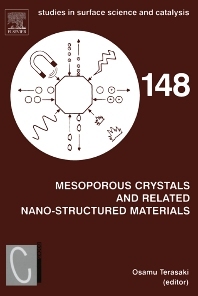 Significance of mesoporous crystals for catalytic application (J. Meurig Thomas, R. Raja). Evaporation-induced self-assembly to functional nanostructures (Hongyou Fan, J. Brinker). Nanostructured carbon materials synthesized from mesoporous silica crystals by replication (Ryong Ryoo, Sang Hoon Joo). Structural study of mesoporous materials by electron microscopy (Osamu Terasaki et al.). Mesoporous Crystals and Related Nano-Structures Materials contains the invited lectures to be presented at the symposium on Mesoporous Crystals and Related Nano-Structures Materials, Stockholm, Sweden, June 1-2, 2004. This book highlights the core research that has led to such a fruitful and exciting field. Passing on, first hand, the synthesis of this novel material makes this book an important reference material to researchers young and old. For scientists and engineers working in the area of zeolitic science, catalysis and materials science.